Despite facing strong competition from big players, non-vessel operating container carrier BLPL Singapore managed to grow its revenue from US$6.3 million to US$27.4 million in four years. A member of shipping corporation Transworld Group Singapore, BLPL Singapore prides itself on its highly customisable services. Whatever the customer wants, they deliver. This tailored service is made possible by its impressive fleet capacity of 18,000 twenty-foot equivalent units (TEUs), of which half is for specialised containers. These special purpose containers enable BLPL Singapore to take on projects with unique customer requests. Cargo type is not the only thing that BLPL Singapore is able to accommodate. Dedicated to a high level of customer service, the firm also offers flexible terms of delivery. Such capabilities and impeccable standards of service are the drivers of the stellar growth at BLPL Singapore. When asked what made BLPL Singapore stand out, BLPL Singapore vice-president Anand Sitaraman replied: "Regional focus". With no less than three sailings per port per week, it is no wonder that BLPL Singapore is one of the fast-growing regional liners. Overwhelming volumes of trade enabled the firm to occupy the top position in Chennai port, year after year. The firm plans to continue growing as a regional container carrier and leave a strong geographical footprint in South-east Asia, China, the Indian sub-continent, Middle East and East Africa. BLPL Singapore started from rather humble beginnings in 2007. Its original purpose was to complement its sister company Orient Express Lines (OEL) which ran feeder ships. But BLPL Singapore exceeded expectations. Even after filling OEL ships to the brim with cargo, there was still plenty of business and huge volumes of cargo demanding to be shipped. Sensing a growth avenue, BLPL Singapore began leasing ships and running its own routes. In 2009, amidst falling cargo demand, the budding company saw more opportunities in ships idling at the harbours. At that time, BLPL Singapore found itself two years ahead of schedule. Its cargo handling reached the optimal capacity faster than expected. It was a good time to expand. BLPL Singapore started snapping up more ships on operating leases and procuring more containers. In return for the bold move, the company obtained favourable terms which gave it an edge in cost-effectiveness. Its fleet of containers swelled by 3,000 to 3,500 TEUs during a time when demand for cargo was waning. That is how the chairman and CEO of Transworld Group Singapore, Mahesh Sivaswamy, navigated the firm in the aftermath of the financial crisis. BLPL Singapore also seized the opportunity presented by the opening up of Myanmar to foreign markets. The company swiftly deployed dedicated container vessel services to Myanmar in November last year. Today, the six-year-old company serves 15 countries and 44 ports, from China and India to Kenya, Indonesia, Sri Lanka and the United Arab Emirates, attesting to its good prospects for the future. A good captain is nothing without his ship. Behind the impressive revenue figures hides a highly sophisticated IT system. A self-customised dashboard allows BLPL Singapore to track each container in real time. The impressive tracking system was developed in-house by a team of six employees. To provide convenient service to customers, BLPL Singapore created "BLPL", an iPhone application which places information at the customer's fingertips. The application allows customers to locate an agent in any of the 44 ports, check detailed dimensions of available containers, track their cargo in real time, display graphically the port locations on a geographic map and obtain shipping schedules. Through the application, BLPL Singapore is able to provide impeccable customer service. 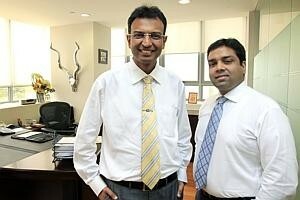 "We believe in a lean structure, a small team," said Mr Sivaswamy. The team's size is one of the secrets of why the company always seems to be able to immediately steer its operations onto the best path of growth, no matter how quickly the paths change. Their second secret is that, contrary to the norm, BLPL Singapore exhibits a very flat and open culture. Everyone can speak up without being encumbered by hierarchies and bureaucracies. "They have to have the right attitude. Optimism and sincerity are traits we welcome," said Mr Sivaswamy. The company also spares no expense for the welfare of its staff and in keeping them motivated. The shockwaves from the 2009 slowdown can still be felt throughout the economy. "Business cycles in general have become very short now," observed Mr Sivaswamy. "The highly volatile market will pose a challenge not only for us, but for our entire industry." When asked if BLPL Singapore was expecting an increase in competition, Mr Sivaswamy said "Yes and no". He explained that new competitors might be attracted by the lucrative opportunities provided by the rise of Asia. But unfavourable market conditions and high costs will make it quite difficult for new companies to enter the industry. Recognising the importance of a strong and highly relevant IT system in achieving operating efficiency, BLPL Singapore will continue to customise their IT systems to support their rapid growth and expansion plans. With solid operations, helmed by capable leaders and steadfast employees, BLPL Singapore will be able to weather the storms and emerge as a regional player.